by Middle East Broadcasting Networks, Inc.
Stay up to date with what’s going on around you in the MENA region, the US & the world. Alhurra mobile app provides you with the latest news with speed and accuracy right from the heart of events. It offers you a wide variety of breaking news and feature stories across politics, sport, business, science, health and technology. ابق على اطلاع دائم بآخر مستجدات الأخبار من حولك على مدار الساعة. تطبيق الحرة للهواتف الذكية يقدم لكم حصيلة إخبارية يومية بالنص والفيديو والصوت بسرعة ودقة من قلب الأحداث، في مجالات السياسة والرياضة والاقتصاد والعلوم والتكنولوجيا والصحة وغير ذلك. The daily content offering includes extensive videos, infographics, polls & opinion articles covering various topics and news events from around the world. It also includes special pages for all of Alhurra’s television programs allowing you to watch all previous episodes on demand. التحديث اليومي للتطبيق يتضمن مقالات وفيديوهات وإنفوغرافيكس واستطلاعات رأي وبودكاست تغطي شتى الموضوعات. كما يفرد صفحات خاصة لبرامج الحرة التلفزيونية تضم كل الحلقات التي تم بثها. •	New design and layout. •	A completely new navigation menu for better usability. •	Breaking news push notifications. •	Live streaming of Alhurra & Alhurra Iraq TV channels. •	Favorite content tab in the menu. •	“My News” tab where users can customize their content of preference. •	Send us your stories using the “user generated content” feature. •	Download articles and videos for offline reading & watching. •	Integrated proxy to view our content anywhere in the world. •	Share your favorite stories, videos, and photos via e-mail & social media. •	تصميم جديد وواجهة استخدام جديدة. •	قائمة تصفح جديدة ومبسطة. •	بث مباشر لقناتي "الحرة" و "الحرة عراق". •	مفضلة شخصية ضمن القائمة الرئيسة. •	إمكانية تخصيص المحتوى عبر خيار "أخباري". •	إمكانية إرسال المحتوى من الجمهور عبر التطبيق. 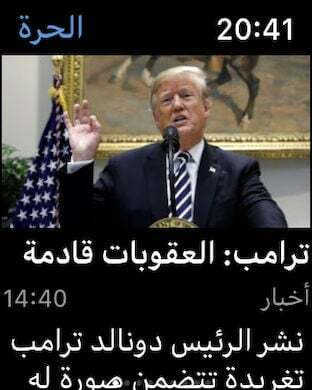 •	إمكانية التصفح بلا إنترنت عبر التنزيل المسبق للمحتوى. •	إمكانية البحث في المحتوى، ومشاركته عبر شبكات التواصل الاجتماعي.